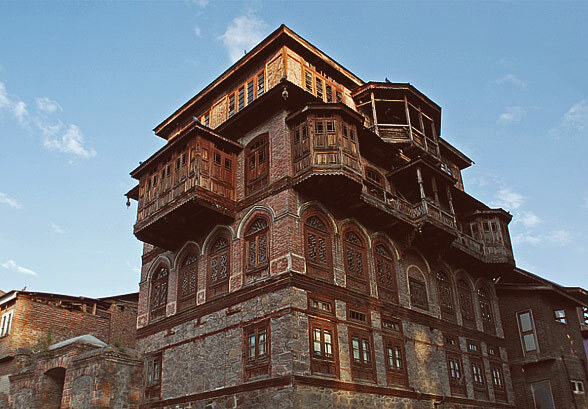 Old Srinagar, known as Downtown seems frozen in time. Walking in the maze of by-lanes, meandering through its exposed brick and wooden structures, often shouting for some care and attention in silence is like talking to an old man who has seen time pass by. You see these old embellishments adorning the dwellings and monuments with carved wood facades, intricate Pinjra on their exteriors, the seamless intersecting lines of Khatambandh on the ceilings, again telling of time…of a beautiful bridge man has made with history… mesmerizing! Going back to the roots of the craft, its name ‘Khatam-bandh’, which might seem mysterious to a non Persian speaker, can be really broken down to get its meaning. Khatam literally means ‘reaching to an end’. But Persian being a language of poetry and one that believes in deeper meanings to life and any of its activities, does not ever refer to anything in isolation. So, there are no absolute ‘ends’ or ‘reaching to end’. It can more appropriately be explained as ‘an enclosure’ or ‘coming full circle’, which makes ‘Khatam’ not representative of a line that has come to an end but more as a polygon that has come to an enclosure. ‘Bandh’ means Close. Joining the two - Khatam-Bandh means polygons closed or stuck together with the help of wooden beading. 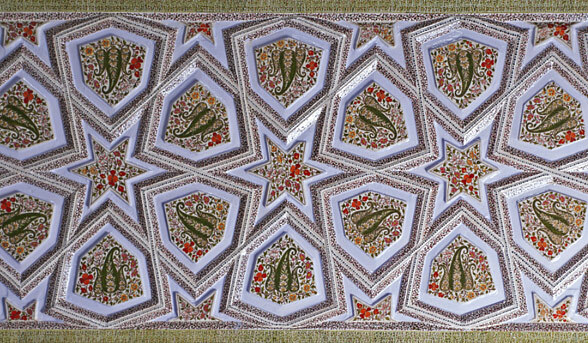 Some other siblings of the craft form can be traced back to Persia, from where the craft originated; Khatam or Khatamkari is referred to an art form of making decorative strips made of wood, bone and metal. The patterns on these strips are formed out of very fine triangular tessellations. 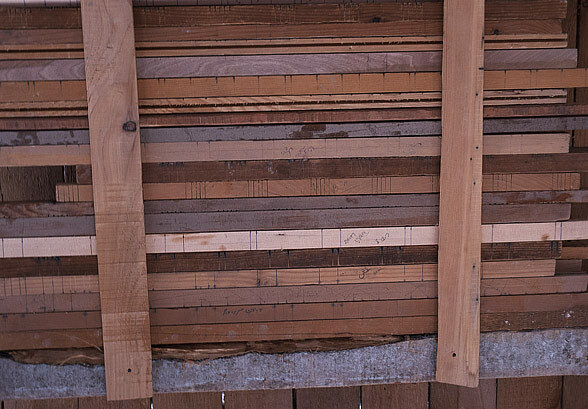 These decorative strips are then applied on wooden backgrounds for decoration on objects. Another form of wood-inlay work also described as Khatam-bandhi or Khatam-sazi encompasses small pieces of wood veneer set on a base and glued or nailed into place. These are used in a variety of applications such as doors, ceilings, windows, boxes and mirrors. None of these crafts have anything similar to Khatambandh technique practiced in Kashmir apart from one thing, that is, the use of polygons. 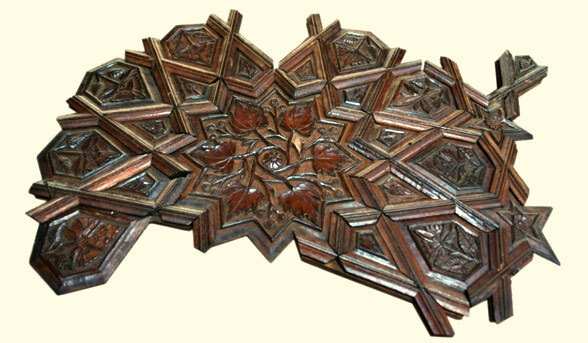 Only the geometric patterns are similar to the wood-inlay or Khatam-bandhi from Persia or present day Iran. 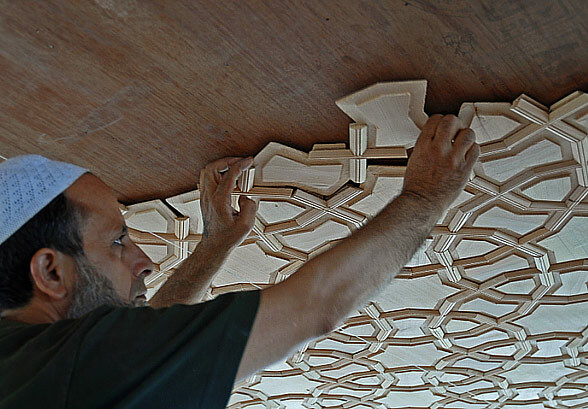 Khatambandh in Kashmir is an art of making decorative ceiling, by fitting small pieces of polygonal wood into each other in geometrical patterns, held together by beadings. There are basically two elements, which make Khatumbandh; one is the beading that is called as Gaj-Patti and second is the polygon called Posh (Flower). Gaj Patti is sub divided into two types - Charat for longer one and Posh for shorter ones. All this is done entirely with hands without the use of glue or nails. Nails are only used at crucial points to anchor the interlocked grid to the base-wood of the ceiling. 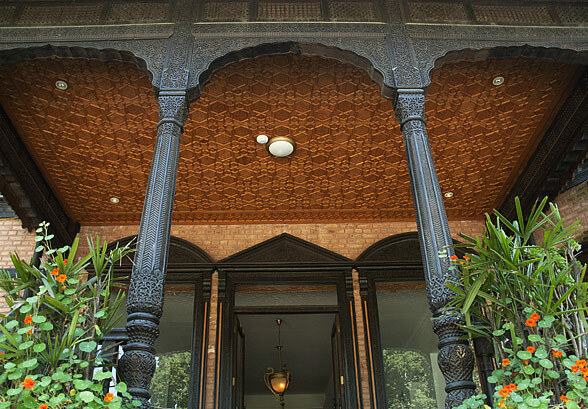 It is used as false ceiling for its functional and decorative needs. 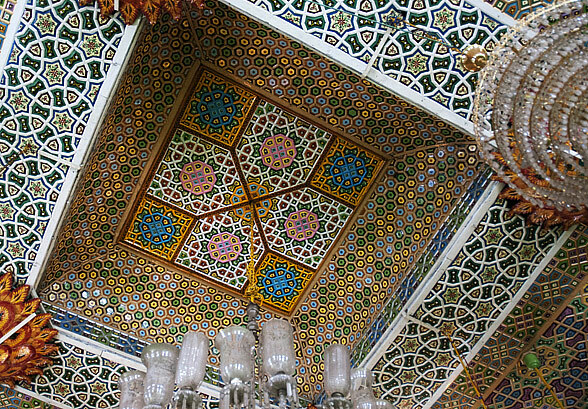 The uniqueness of this art is that when the ceiling is complete, it acquires a unique seamless geometrical pattern. Times when you stare at Khatambandh ceilings, the shapes morph into each other creating an illusion, transforming the seamless ceilinging to a dynamic installation, like a starry sky. Fir wood, which is very light as compared to other hardwoods, is used in making of Khatambandh. Their lightweights make it ideal, as it does not bulge down with its own weight and stays in place with fewer or no nails used at all depending on the design. Fir is a conifer and is most closely related to the cedars (Cedrus). Fir is found in abundant in the mountains of Himalayas and around the mountain ranges of Kashmir valley; they also use Deodar (Pine) and Walnut for making Khatambandh if needed. The wood is processed, cut into batons and panels and then fixed onto the ceiling in various preconceived geometric patterns. 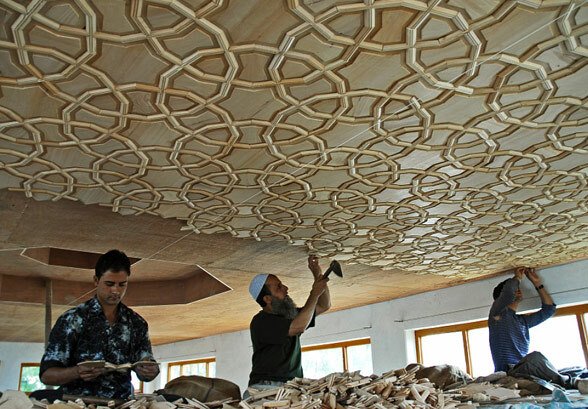 It is a painstaking work, which once used to take months to finish a 10 feet by 10 feet ceiling. Earlier Khatambandh used to be a domain of shrines, palaces, houseboats and royal houses but now every other person has and wants it for their house. 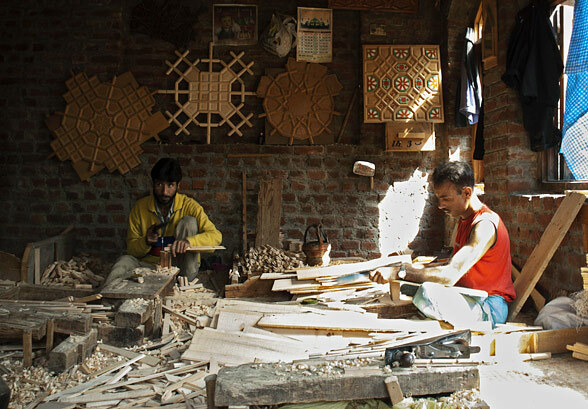 There are traditionally more than 160 designs worked out within the craft in Kashmir. Only 100 of these can be reproduced today and only 10-12 patterns are commercially made. About 500-700 odd Khatambandh artisans in Srinagar cater to this demand. They work in groups of 10 -15 under a master craftsman or Wasta and are trained to do certain processes involved in making of the components. 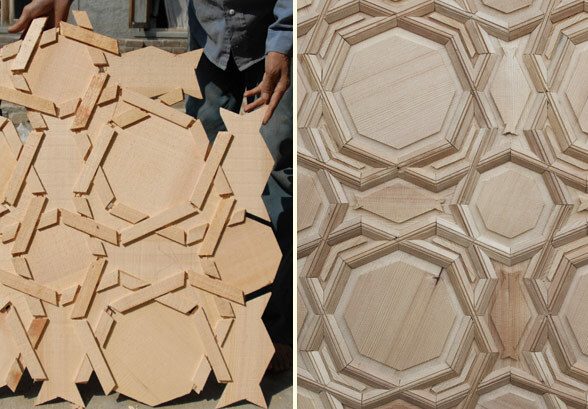 As the craft incorporates different geometric shapes that are tessellated, the work is very repetitive. The wood is processed through machines for planning, sizing and groove making for Gaj and for making Posh. The basic shapes are cut on custom made motorized circular saws and then worked with hands for final shaping. A set of scales called Kannat for different patterns is used to mark the Gaj-patti to cut the interlocking lap-joint. 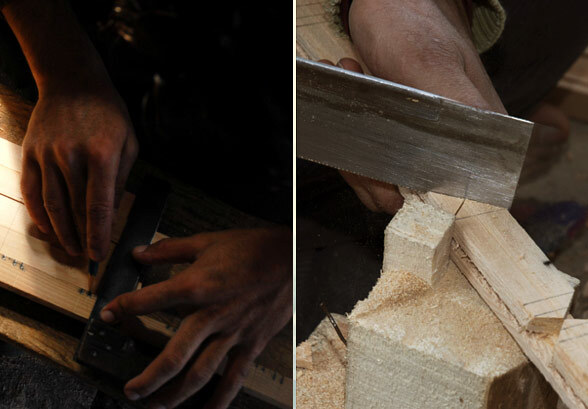 Craftsmen have indigenized tools and machines made by using locally available woodworking power tools. This reduces the time consumed, besides providing compact flawless geometrical shapes which cutting by hand would usually take more time and effort. These improvisations where made to keep the cost of Khatumbandh more affordable and accessible by a larger segment of market.As compared to Pinjrakari that uses straight batons, Khatambandh is made of a 5-sided polygon beading, which criss-cross and interlock forming a maze of Gaj that hold the Posh (the wooden polygon) in place, within the groove. Without the Posh the arrangement of interlocked Gaj form an open lattice much like Pinjra but larger openings. When Pinjra was unavailable and glass came into being, the windows took on a new form, with glass polygons inserted in between the Gaj lattice. There are different theories and stories about the art of Khatambandh and its origin. Some say Mirza Hyder Tughlaq brought it to Kashmir in 1541 in Mughal times and some believe that famous saint Shah Hamadani who visited the Himalayan valley along with many followers that also included Khatambandh artists from Persia brought it to Kashmir during the 14th century. 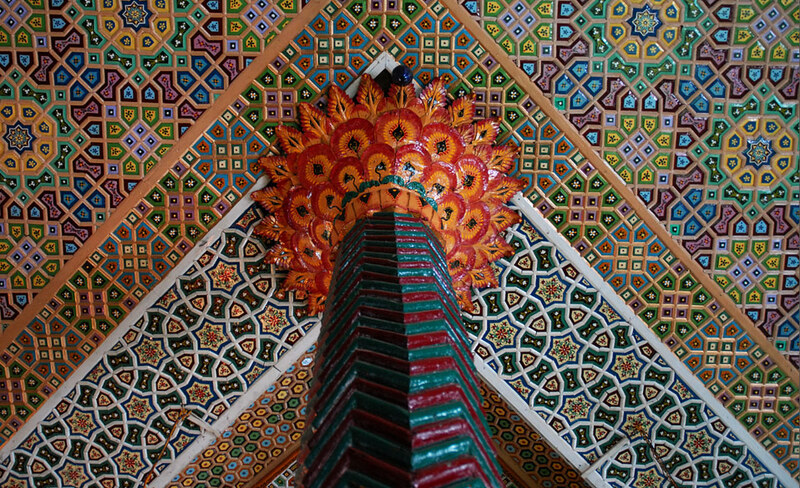 The shrine of Shah Hamadani in Srinagar has the most complex Khatambandh Installation that is in the form of a crossed dome. The text was as good as the subject!! !